Today is one of those lazy days when even making some spam musubi is out of the cards. I want to do nothing but lay around on my precious day off and take a nap with Tiara. 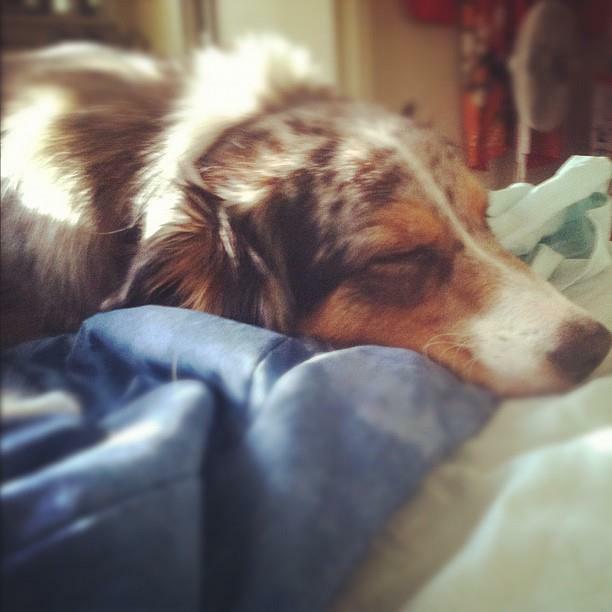 Even Tiara wants to do nothing but doze off in the air conditioning, and she's a hyper Australian Shepherd! I blame the heat, personally. So this donburi is kind of a deconstructed spam musubi in a bowl. I have shared my unending donburi love in previous posts, but really, there is nothing easier than a one skillet meal on top of fresh rice. The same flavor elements of a spam musubi are present, without having to bother with molding the rice and wrapping it in nori (yes I know it's not a lot of work, but haters please refer to the first word in the name of this post). You can either use just equal parts sugar and shoyu, but I like the glossiness that mirin lends to the sauce, as well as keeping this whole dish from being too salty. Like with my spam musubi post, I encourage you to play around with the toppings. Green onions, avocado, okonomiyaki sauce and mayo, shichimi togarashi, sriracha mayo, wasabi mayo, it's all game. My birthday knife from my aunt! A completely random but not unrelated note: this year is SPAM's 75th anniversary! Perusing the official SPAM page, I found a lot of fun recipes to try. Perhaps I will submit this to the SPAM fan's recipes they feature, hehe. Note: I like the low sodium Spam for this recipe... this can be much saltier than a musubi depending on your ratio of Spam to rice. Slice the Spam into 1/4" slices, and in turn chop the slices into 1/2" squares. Fry the Spam over medium heat until crispy in a large frying pan. Mix the shoyu, mirin, sake, and sugar together and pour over the spam. Stir until reduced by half. Place the rice into two bowl and roughly tear the nori into chunks to place over the rice. Spoon the spam over the nori and divide the sauce between the two bowls. Sprinkle with furikake and serve. Serves two. This looks so good! I grew up eating spam, but they were usually pan fried. Nothing else. This is a great new recipe for my spam adventure. I can't wait to try this.